Working with generic nodes and tasks (T). Working with the Script Control tasks when the agent is unknown. 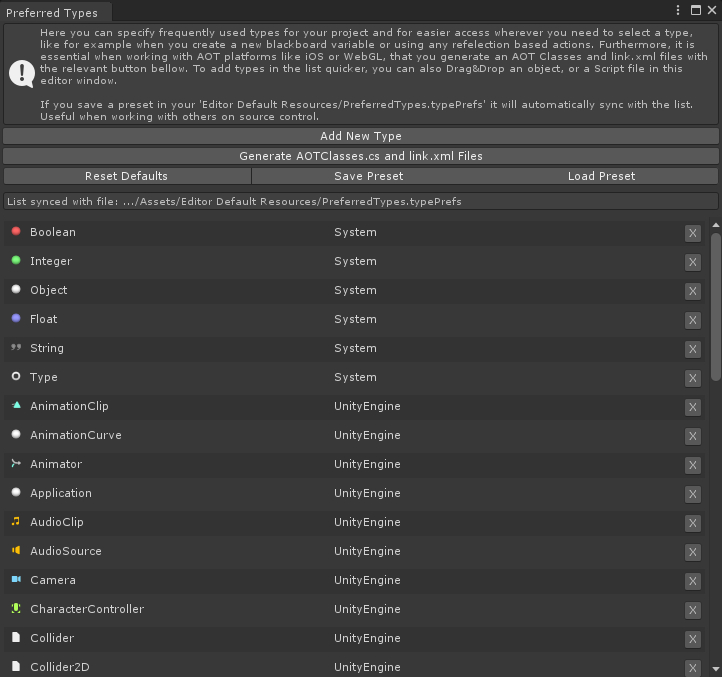 Opening the Preferred Types Editor can be done through the “Window/NodeCanvas/Preferred Types Editor” unity top menu. As you will find out, there are a number of types already in the list by default, but feel free to modify the list however you see fit to your project. Adding types in the list, can also be easily done by drag and dropping an object (like a component) or a script file in this editor window. This editor and it’s use, is strictly an editor thing for faster workflow and has nothing to do with runtime.